With the release of premium CableMod cables just one short year ago, PC enthusiasts can see the difference some innovation and care makes to PC cables. Today, CableMod announces our foray into the world of PC lighting with CableMod WideBeam LED Strips – the ultimate PC lighting solution. 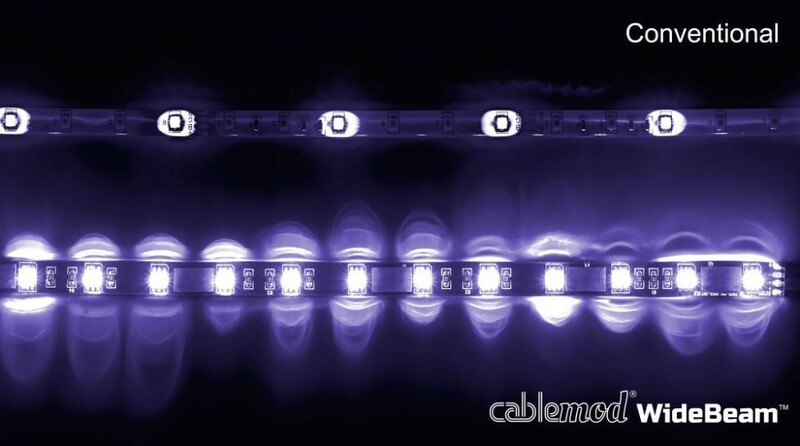 CableMod WideBeam LED Strips exhibit the very same care and attention to detail that CableMod brings to PC cables. We’ve rethought virtually every component – from the adhesive and power connector, to the LEDs themselves. The result of all of this is a series of LED strips that truly have no equal – a perfect lighting solution for the discerning PC enthusiast. The story begins with the specially-designed LEDs used on these LED strips. Dubbed WideBeam, these LEDs are not only some of the brightest available, but also feature a beam angle that is up to fifty percent wider than conventional LEDs for a more even lighting effect. With WideBeam LEDs, you can be sure that your prized components are lit evenly and beautifully. Part of the reason to install LED strips is to customize your system your way. To that end, CableMod WideBeam LEDs are available not only in a wide variety of colors like red, green, blue, and white, but also in UV – ideal for highlighting your UV reactive components. And for those who want to select from a range of colors, these LED strips also come in RGB, complete with convenient IR receiver and remote control. CableMod RGB LED Strips also come with a special adapter that allows them to work perfectly with ASUS motherboards that feature an RGB header, like the ROG Maximus VIII Formula. Both the WideBeam Magnetic and WideBeam Foam Series will come in two different lengths (30cm and 60cm), as well as a number of colors and configurations.